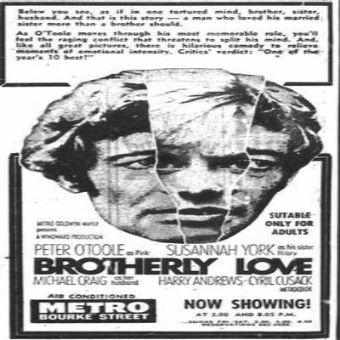 In this British tragi-comedy taking place among emotionally bankrupt upper-class Scottish countrymen, Peter O'Toole plays Sir Charles Henry Arbuthnot Pinkerton Ferguson, a mentally disturbed Scotsman, living on his uncared-for farm, who also harbors an incestuous yearning for his sister Hilary (Susannah York), who is staying with Sir Charles after a fight with her husband Douglas (Michael Craig). However, while at a local sheep auction, Hilary encounters Douglas and she realizes she still loves him. Hilary and Douglas agree to meet that night at a country dance. But Sir Charles finds out about their intended rendezvous and at the dance that night, continually interrupts Hilary and Douglas's reunion. Sir Charles further hampers a reconciliation by allowing Hilary to think that Douglas is the father of a maid's illegitimate child. Hilary, in reaction, goes wild and becomes the complete party girl, propositioning the band leader but going off with Jock (Brian Blessed), the real father of the maid's child. When Sir Charles finds Hilary asleep in his car the next morning, and Hilary tells him of her antics of the night before, Sir Charles lapses into a deep depression as he realizes that his sister is lost to him.